I love me some football! And, like most Americans, what I really mean is that I love watching and following football and drinking beer while watching and following football. Of course, I seldom play, but why would I play when I’m in four fantasy football leagues? I’m not a player, I’m a General Manager four times over! I’m much too busy to burn any calories on the field. You can upload your own team image in ESPN. Let’s throw out #1 for the purposes of this discussion because I have no empirical evidence to show that charging for live stats is a mistake by Yahoo. For all I know, it’s a great financial move for Yahoo since most guys are trapped in a league that they didn’t create and will have to buy the StatTracker feature anyway. Kind of like how movie theaters are able to charge so much for Goobers: it’s a captive audience. Let’s focus on #2. My favorite thing to do with my team image is to find an image I like online, maybe edit it a little bit, then upload it onto Flickr and use it as my team’s banner around which to rally during the season. For example, for my Wpromote fantasy team, Block’s Black Lions, I found a cool picture of the black lion from the show, Voltron, cropped it appropriately and threw it up on Flickr. Now, all other teams tremble before my slick mascot, as well as my 4-3 record. Score one for ESPN, because nothing is as much fun to do, especially nowadays, as customization and personalization. In Nintendo Wii you can make your Mii look just like you. In World of Warcraft, you can make your Elven Princess ride a horned zebra. In Yahoo’s fantasy football league’s, though, you are limited to choosing one or a dozen preexisting helmets or using their childish-looking avatars. Why not just let people upload their own images? This might seem like a frivolous issue, however, it must be remembered that YAHOO OWNS FLICKR! Because of this, isn’t it a no brainer to not only allow people to customize their own images but to easily integrate this process with the world’s most popular image sharing system? Wouldn’t this serve to naturally and significantly boost activity to Flickr, another Yahoo property? 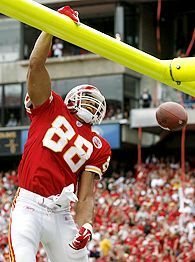 Wouldn’t this allow for the creation of Flickr groups based on the most creative fantasy football team pictures? Yahoo has something that Google does not: communities. The fantasy football community is full of a bunch of jock/nerd hybrids that love to talk trash and engage in calculated side bets. The Flickr community is full of a bunch of artsy-fartsy photogs with style and creativity to spare. Needless to say, there isn’t a lot of overlap between the groups; however, that isn’t to say that there couldn’t be. When left brain meets right brain, you’ve got a fully functioning organ. Why not try to get the fantasy football guys into the Flickr space and vice versa? Not only are all of the tools available, they are all owned by Yahoo! And every single user could have Yahoo search available on both properties as well as advertisements in front of them to drive Yahoo revenue. In my opinon, Yahoo is missing out. It’s not the innovation or revenue potential that confuses me, rather, it’s the fact that it would be so easy for Yahoo to do this. I wouldn’t suggest that making Flickr better integrated with fantasy football would solve all of Yahoo’s ills, but, in a world where Yahoo’s stock is falling and Google’s dominance seems inevitable, shouldn’t Yahoo be doing every little thing it can to win over users? Not to mix metaphors, but I’d say that’s a slam dunk. Holly’s fish died, let’s take a moment to commemorate Olly’s death. 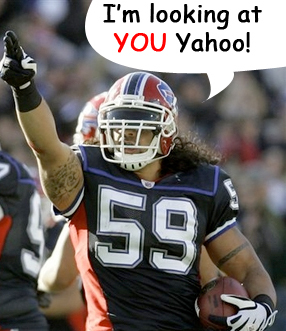 What if Yahoo combined with World of Warcraft and you could upload your avatar to Fantasy Football? The world might stop for a second in amazement at the genius behind such an idea. I think combining Fantasy Football and WOW is a little scary. That is WAY too much fantasy for me to handle, but you might just hit that pretty small crossover demographic. I thought you liked fantasy, Stone.